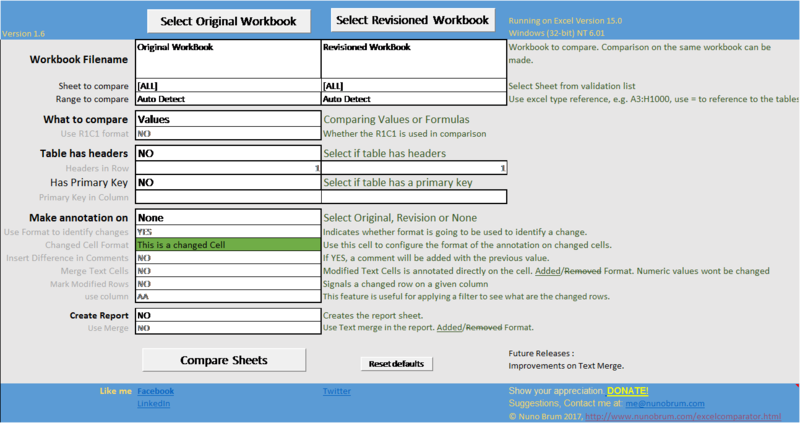 Excel Sheet Comparator is cross platform (Windows, Mac OSX) tool that allows comparison of two excel files. This already sets it apart from many other tools that work only on windows. besides, it doesn't need installation and allows to quickly merge two different files. Donations serve to support costs with website hosting and with financing the development of other tools. The excess will be sent to non profit and community organisations. Allowing the comparison of All sheets with a primary key. Comparing Formulas will also compare texts. Fixing problem when opening for the first time. Selecting open files is made easier. Supporting both Filenames with spaces and without spaces. The former version had problems with it. Fixed all the corruptions made from the Mac to Windows transfer. You are like me and using Excel for everything, you've probably came across the problem of: How to compare two excel sheets ? In the absence of a good available solution, I decided to make one. Please find it in attachment. It's still the first version and it's still missing some features, but already does the job. The current limitations is that it doesn't detect inserted or deleted rows or columns. This I'll add in a next version. So, next time you need to compare two excel sheets, I hope this will serve you well. I'd love to hear your comments if you have some.